Take a trip to Chocolate Island and indulge in the chocolate silk, white chocolate mousse, coconut, and Double-Dutch chocolate flavors. 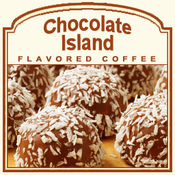 Made with 100% Arabica beans, the Chocolate Island flavored coffee offers 2 calories per cup and loads of delicious flavor. Let the sweetness carry you away with the coconut flavor fusion blended white chocolate mousse! A heat-sealed valve bag will ensure the freshest coffee � which will be roasted and shipped on the same day. This Chocolate Island flavored coffee will hit the spot with its richness of chocolate-infused coconut flavors.